Essex Road II, 2015. Photo: Josh Redman, courtesy Tintype. LONDON.- ESSEX ROAD III  eight contemporary artists interpret a very particular part of London. Now in its third year, Tintypes Essex Road invites eight artists to each make a short film connected to the mile-long north London street. 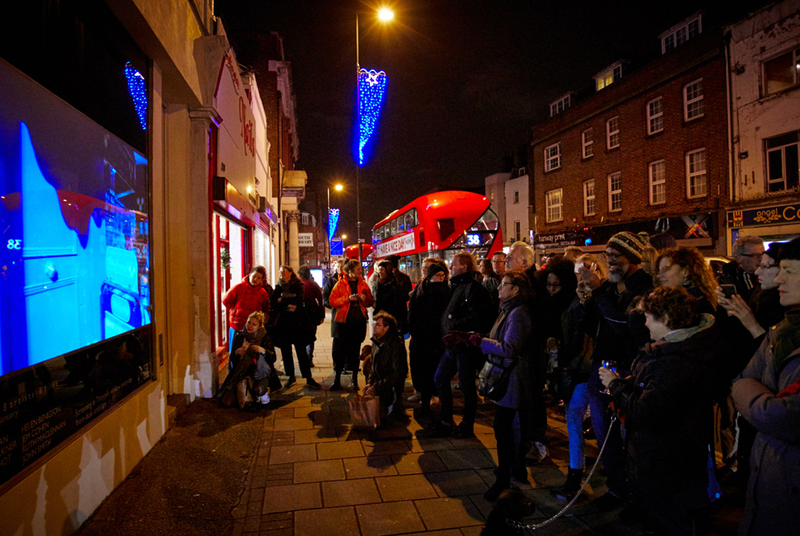 Tintypes large gallery window, on a busy corner of Essex Road, becomes a public screen for six weeks over Christmas and New Year. The films are shown on a loop, back-projected into the window from dusk to midnight, and are highly visible to the broad range of passers-by. SUSAN COLLINSs film is a search for wildlife in Essex Road. From a stuffed rabbit, ornamental horses, and deer paintings, to pet dogs and pigeons, this portrait captured over a few days in late summer and autumn 2016, finds animate and inanimate wildlife in the road and pinioned behind glass: windows are the framing device for Collins quest. Susan Collins is one of the UKs leading artists working with digital media. She is particularly interested in the social customs of different kinds of public places and their rules of engagement. This film will be the latest in her series of works playing on the relationship between the photographic still and the moving image. LYNNE MARSH has gone inside the famous ex-Carlton Cinema on Essex Road to film services at the Evangelical Church that now owns the building. She is particularly interested in the way that evangelical worship is a performance in which the congregation participate and praying mostly takes the form of singing. The auditorium is currently being renovated and restored back to its original proportions so the notion of re-birth is both literal  the building  and metaphorical in the way that resurrection underlies the ethos of this form of religion. Architecture  its patterns, structures and textures  is a re-occurring motif in Marshs moving image work. She incorporates performance and installation into her practice and is drawn to the mechanics that create an experience; the choreography of support, or, as she puts it the theatre behind the theatre. JENNET THOMASs film A Tale I Know Nothing About features themes of resurrection, entertainment and death. Inspired by the fantastical Neo-Egyptian Art Deco cinema on Essex Road, once a bingo hall, Thomas weaves a visual poem of pigeon-gods, roving eyeballs, and a dead policeman through the animated verses of a Dada-esque nonsense rhyme  a mysterious folk memory that has passed through generations of London playgrounds. Thomass moving image work conjures delirious parallel universes in everyday Britains most mundane corners. She makes films, performances and installations exploring the connections between everyday life, fantasy and ideology. Like a painting with kinetic elements, AMIKAM TORENs film Going Nowhere presents two looped images on a split screen: on the left, a helicopter moving up and down above its landing pad on top of a tall building, while in the adjoining image a young man paces up and down a section of Essex Road swinging on his finger a chain with a key ring. The helicopter through its rotating blades and the young man through his rotating key ring and chain keep themselves on the move ­ yet both are going nowhere  movement and stasis together. Toren is recognised as a major conceptual artist whose work constantly questions the process of painting, turning representation on its head to reverse the maxim that representation excludes its subject. For the last twelve years, filmmaking has formed an important strand within his work, creating video projects structured around the intricacies and dramas of building projects in London. Toren appears courtesy of Anthony Reynolds Gallery. JOHN WALTERs film combines live footage with animation and takes David Lynchs 2001 film Mulholland Drive as its inspiration. It focuses on the relationship between two characters who are doppelgangers. Costume changes and narrative ellipses create an open-ended and non-linear story that hints at dark goings on in Essex Road. Excessive, colourful and extreme, Walter describes his work as maximalist. He likes to seduce his audience into engaging with complex and often uncomfortable subjects such as sexual health through an exuberant use of colour, humour and hospitality. Walter creates fictions that begin with his personal experience and quote the voices of others, weaving them together into epic new works. Structured around a narrative poem, ALICE MAY WILLIAMS retraces and invokes a personal story of love lost on the Essex Road. Photographic images from popular culture tell a story of lesbian desire. Love is thwarted by the excessively efficient 38 bus service. Anecdotal detail (the pub where the man Who used to be in Coronation Street, Does the quiz on a Tuesday) intensifies the mood of bittersweet regret. Alice May Williams was selected for this year's Jerwood/FVU Award; the work she created was a meditation on the changing face of Londons landmark Battersea Power Station  the smokestack energy colossus of yesteryear now rapidly transforming into an upscale lifestyle playground of tomorrow. JOBY WILLIAMSONs film is a tale told by looking through shop windows. Essex Road is peppered with small shops and public spaces, an assortment of independent businesses that clamour for your glance, your attention and your engagement. Windows are cleaned, obscured, replaced, walked past and peered into; the mutating identity of a place of commerce and sociability. Williamsons practice pivots around the inverted memory we apply to objects and acts as an archaeological dig of todays artefacts. His recent work observes the material trails of our encounters and rejections as we fall in and out of love with the ways and the things that we choose to live with. Formerly know as Lower Street, Essex Road holds much of the last traces of Islington's more diverse, deprived and communal social origins. In ANDREA LUKA ZIMMERMANs film, Ella the pilgrim hound of hunger and dispossession, encounters temptations of finance, flesh and intoxication from those like her in their outcast status. Her search for nourishment brings threat from the dogcatcher and a terrifying glimpse of a possible hollow future. Resisting and enduring, it appears that she has found the food she craves in a twilit glade. But is she truly clear of danger and the darker forces at work in society? Andrea Luka Zimmerman is a filmmaker, artist, cultural activist and co-founder of the artists' collective Fugitive Images. Her films are about the marginalised and the overlooked and their often-surprising resilience. She is currently working on a project for Artangel inspired by Vittorio de Sicas classic film Bicycle Thieves. San Francisco Museum of Modern Art presents William Kentridge's "The Refusal of Time"